Click on the image to see an animation of the climbing wire. Many of you 3pin users may have wondered what those 3 sets of holes were in the base of the heel pieces. Well, our new climbing wire is done and just happens to fit in those holes…..We finished the wire design late last season and did our initial testing in the spring and early summer. We will test it a bit more to confirm the design again and then be offering them on our website. Following our overall design concept, we tried to keep these simple, sturdy, and easy to use. As with the heel pieces, the climbing wire is designed to fit a range of boot sizes. 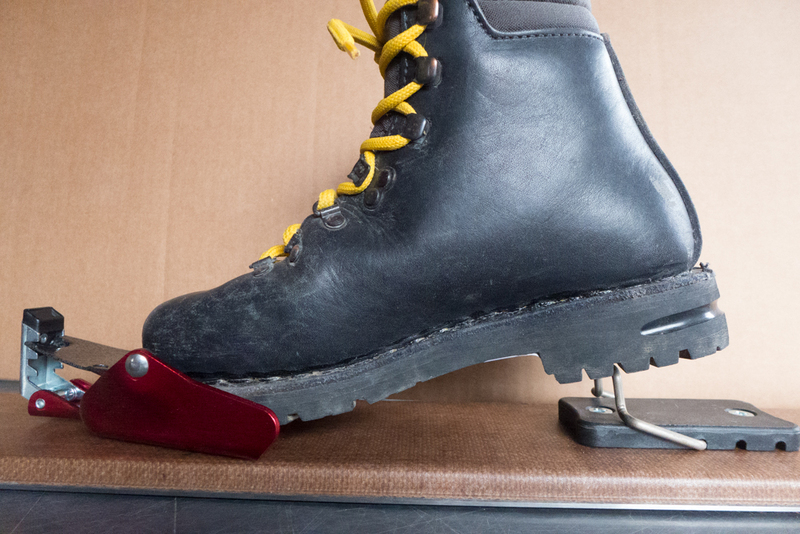 We have tested the wires with a size 5.5 women’s boot (see picture) up through a men’s 13. There are 6 possible location settings with 3 sets of holes on the heel pieces and the 2 locations for the heel pieces on the Hok (3 inserts for the 2 holes). 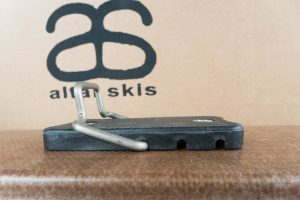 Unlike a lot of climbing wires, the design is easy to use and relies on gravity, sitting on top of the heel piece when engaged rather then depending on a spring or indents to hold it up and place. We find these systems to be finicky and hard to put up and down. The climbing wire in the forward set of holes and in the ‘up’ or climbing position. The wire is spring steel and stainless. Cost for a set of wires will be $9.75. ← Testing and development of the Kōm.